Click to See the Slide Show of our Laparoscopic Training. The initial training of the surgeons and gynecologist will be given in experimental operation theatre and once they will be acquainted with the ergonomics and hand eye coordination of laparoscopy they will get exposure in real operation theatre with our experienced laparoscopic surgeons. The experimental operating room at World Laparoscopy Hospital is a unique teaching unit and only one of its kind in whole world. 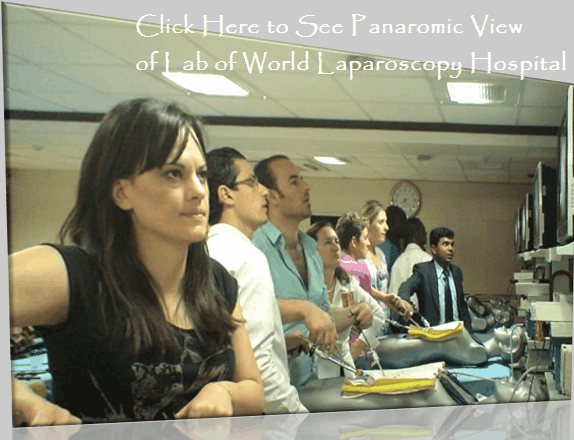 It is very difficult to get in whole world better infrastructure than Lab of World Laparoscopy Hospital. The modern minimal access surgery lab comprising 10 experimental surgical working high definition stations linked by a high-speed image transmission system. We take only limited student in one batch so that they can work comfortably. Each working station is composed of an operating table, a digital laparoscopic camera coupled with a 250W cold light source, a broadband thermal insufflators, high frequency electro surgical generator and a vacuum suction-irrigation system. ( Each station features 5 and 10 millimeter optics with 0° and 30° view angles telescope. We don't use simple endotrainer because the surgeon will not get the real feeling. Passwords for member surgeons to avail our private member area (World's Largest collection of Laparoscopic Videos, PPT and eBooks on the web) free for our trainees and continued onlin support and CME accreditation. Twenty DVDs containing laparoscopic videos of more than 30 minimal access surgical procedure. We give real instrument to every candidate so that they can learn all the essential skill of minimal access surgery. Each operating table can be lit up by a surgical scialytic. All the Diploma and Fellowship Laparoscopic Courses are recognized university courses, endorsed by World Association of Laparoscopic Surgeons and Fellowship Robotic Training is Recognized by Intuitive Surgical incorporation da Vinci® Surgical System, USA. Admission is on first come first serve basis but if the applicant are more for same month candidate has to take online entrance exam. There will be one online entrance test and after qualifying this online entrance test, surgeons and gynecologists will be selected for this "Hands On" laparoscopic training course. Because of our international recognition we keep all our infrastructure of training up to World Class. World Laparoscopy Hospital is also ISO 9001 certified institution with international benchmarking and certification. We have a dedicated team of staff who work very hard with trainee surgeon and gynaecologist so that they can develop their skill without any difficulty. Our five star ranked lecture theatre is linked by an interactive multimedia teaching system with high resolution LCD XGA Projector, which displays different kind of images, videos, such as external views using a camera incorporated in a scialytic, endoscopic views of the chief expert's table and images from a multimedia computer presenting all surgical procedures in laparoscopic surgery. Every day surgeon and gynecologist will get high quality lecture by our expert laparoscopic surgeon. We have a dedicated resource area also with Wi - Fi enabled broadband connection. Our resource area and library is 24 hour open and equipped with 10 high end desktop computers dedicated for trainee surgeon and gynaecologist. These computers are connected with international libraries of World so that surgeons can search the net and discuss with the faculty without the latest advancements of minimal access surgery. Our entire hospital is wi-fi enabled and candidate can bring their laptop to get connected with of member area and international libraries from all over world. Our resource area is also having the facility of video player, printer, fax and 24 hour chatting so that the surgeon who are away from their home will remain in touch with their family. All our facility is five star so that you can enjoy each and every moment of your stay at World Laparoscopy Hospital. Surgical dress is provided at the time of experiment and O. T. exposure. In order to comply with real surgical conditions, participants are assisted by a theater nurse. In addition, an expert laparoscopic surgeon supervises operating tables to facilitate learning acquisition. Note: Course fee include all the lab material, cost of consumables during practical, all the study materials, lunch and refreshment. However, boarding and lodging cost is not included in this fee.Note: Upon prior request accommodation can be arranged in hostel of World Laparoscopy Hospital .